An introduction to the world of distributed file systems is presented with a humble attempt to categorize them. A problem of choice is considered from the workload profile point of view, and some common issues and pitfalls are discussed. A practical OrangeFS experience is given with tips and tricks for better performance. redundant and highly available solutions. There are dozens of solutions available1, and many of them are open source. But how to choose one you need? There is a lot of ambiguity and vagueness in this field, but let’s try to sort it out. Focusing on open source solutions, one can see they are usually sufficient for any needs and are used on the most high performance systems from Top-5002 list, especially in the top 50 of them. Even the term “distributed” is ambiguous itself. It may mean all kinds of file systems running on more than a single host (sense used in a title of this article), but it also means a subset of this common sense discussed below. It should be understandable, that there is no canonical definitions in this field, so terminology found in different sources may vary. Of course, there is a large intersection between these sets. See fig.1 for details. Network file system usually means one with a single server (or at least an appearance of a single server) and several remotely connected clients. Classical NFS3 is a good example (but not with pNFS4 extension). 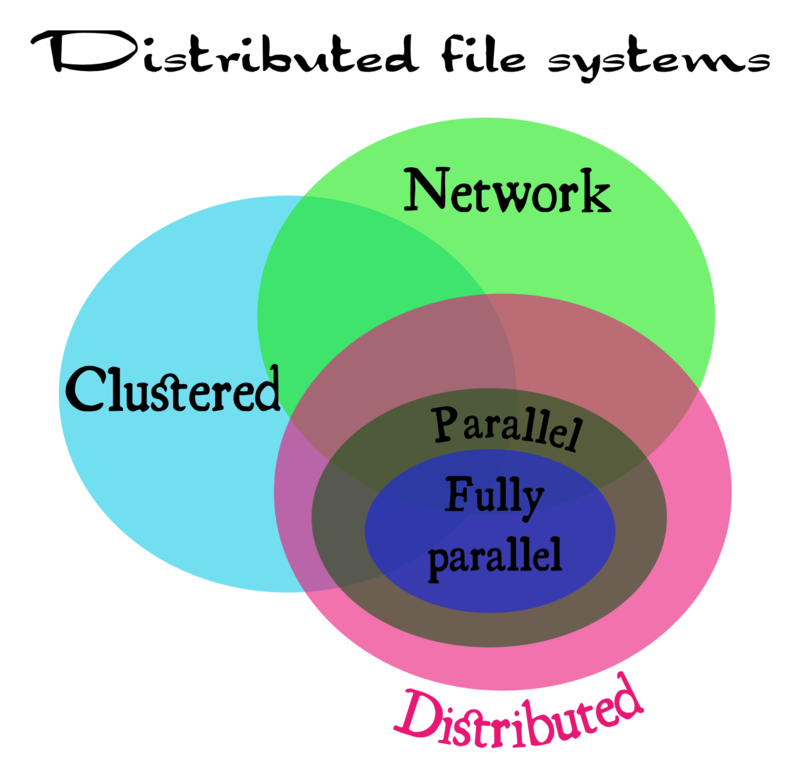 Clustered file system is a file system simultaneously mounted on several local servers sharing the same data storage on a block level (usually the SAN5 model is used). These kind of setups is called shared disk file systems often. Well known examples are OCFS26 and GFS27 file systems. Distributed (in the narrow sense) file systems are setups with multiple data servers sharing nothing between them, for each active server its own data storage is private to it. This systems usually are not geographically distributed and are local in their location due to demands of high performance interconnect (e.g. pNFS3 extension of NFS2 falls here). But there are solutions present for geographically distributed systems, even for setups distributed across different continents. Andrew File System (AFS8) is a good and widely used example. Whenever file system is called parallel, this means it provides a parallel access to (usually all of) its storage hosts for each of its clients. This allows to avoid a bottleneck of a single host in terms of both network and I/O bandwidth, latency; CPU and cache limitations. These file systems are usually used in the High Performance Computing (HPC29) and high-end business applications like stock exchange information systems. Prominent open source examples are Lustre10, OrangeFS11 and Ceph12. Parallel file systems are fully parallel when not only data, but metadata is also distributed on multiple servers accessible in parallel by clients. This is quite important for high-end performance as single metadata server will eventually become a bottleneck, especially when dealing with large directories. For example, OrangeFS11 and Ceph12 are fully parallel distributed file systems, but pNFS4 ad Lustre10 are not. Each class described above may contain an HA solution. Usually this is done by either a data replication (as in Ceph12) or by a disk level redundancy (RAID5/6) together with a server level redundancy (heartbeat/pacemaker) as in Lustre10 or OrangeFS11. If you’re working in the HPC9 field, you’ll be definitely interested in the MPI13 I/O support. ROMIO14 implements just that and is supported by many file systems, e.g. NFS3, Lustre10, OrangeFS11. what kind of locality are you targeted on? are your data servers exclusive for your storage tasks? are you working in trusted environment? prefer large data chunks over a large number of small network packets — they hinder TCP/IP stack greatly. no unlink(): if file is gone, then it is gone immediately and forever. OrangeFS should not be used for $HOME. on ethernet use jumbo frames. There is no perfect distributed filesystem: to achieve the best in one aspect some others must be sacrificed. But if you understand your workload, you’ll be able to pick up a few solutions, study them to your best and have fun! In my humble opinion the most interesting and promising solutions for their fields are: Lustre10, OrangeFS11, Ceph12 and pNFS4. P.S. Always send your patches!